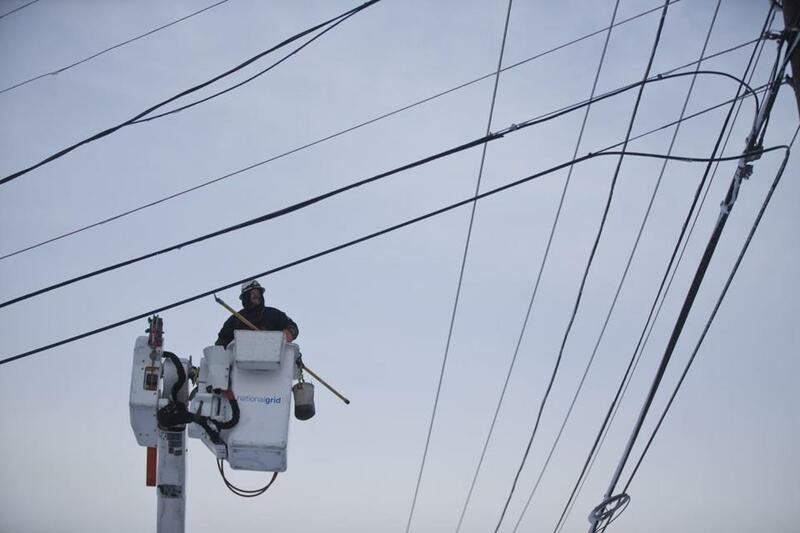 National Grid utility worker worked on a power line on Washington Steet in 2013. Hope springs eternal amid New Hampshire’s vast forests and sweeping mountain vistas. Eversource recently suffered a setback in its quest to win approval of Northern Pass, a $1.6 billion power line that would stretch for 192 miles across the Granite State. The state’s energy siting committee said it woulddelay its decision until the end of March. New England’s largest utility sees the long-discussed project as an advantage in a competition for a big renewable energy contract in Massachusetts, one that would likely draw hydropower from Canada (hence the need for a connection to the north). The high-stakes contest will be decided in January -- before Eversource gets the all clear for Northern Pass. But Eversource’s Lee Olivier on Thursday painted a bright picture during an investor call. Olivier reassured analysts that Northern Pass is on track. Other key permits will come later this year, he said, and the company still plans to start work by July 2018, in time to finish by late 2020. What about litigation? Critics say this project would mar the landscape, and a lawsuit seems almost inevitable. But Eversource officials say the permitting process has been so extensive, a legal defense should be airtight. Olivier said Northern Pass remains well positioned for the Massachusetts energy competition. If Eversource loses? The company’s partner, Hydro-Quebec, wants more than one new power line into New England, Olivier said, and there are potential procurements to be had coming from Rhode Island and Connecticut. As for the contract in Massachusetts, speed to completion could determine the winner. That could be one reason Eversource is sticking to its latest timeline, no matter how optimistic it might seem to its rivals.